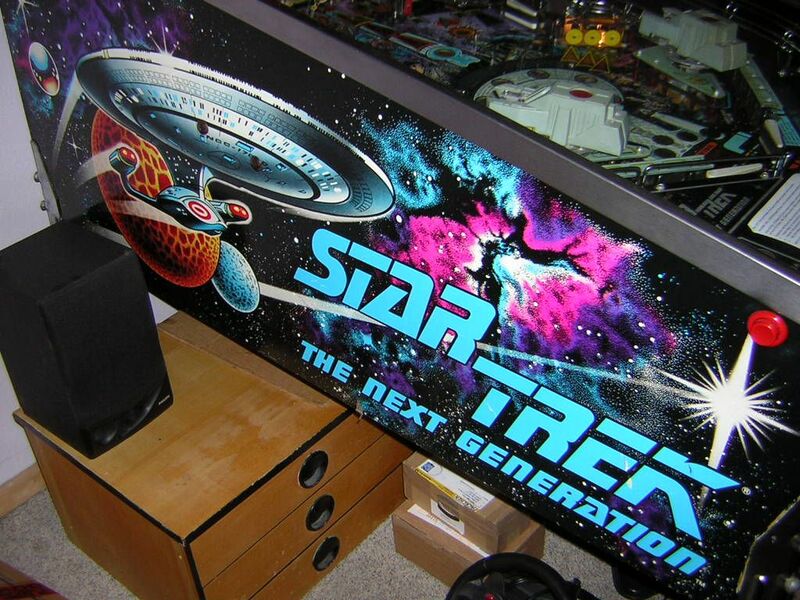 Star Trek: The Next Generation, which is commonly abbreviated by STTNG because of the long name (which needs to be fully written to avoid confusion with the classic Star Trek machine from Bally), is one of the biggest and most popular modern pinball games ever created. Many collectors never even think of giving their STTNG away, yet there are some in sale circulation all the time because so many were made. This means that acquiring an STTNG is very easy, however it's more difficult to find one without problems and in fine visual condition for a fair price. 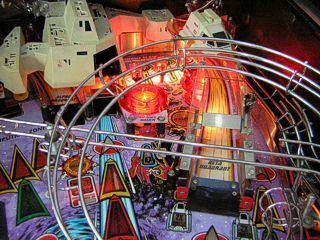 STTNG does have technical and optical problems which are very common and is therefore not for everyone, but the game itself is said to be one of the most complex and exciting pinball adventures of all time. Many simply find this machine to be the best on earth. Of course, the Star Trek phenomenon serves as the perfect basis for the perfect (?) machine, and it is no surprise that Williams took the opportunity to make their biggest game ever in 1993 with the full license of Star Trek: The Next Generation, which is the most popular and most successful series of the franchise. At the time the series was scheduled to launch its final season #7, so the popularity had been laid down to create a true hit seller in the pinball industry. Probably everyone who has even remotely watched TV or has any knowledge of film and television knows what Star Trek is, so player access is the widest a pinball game can get. I'm not a Star Trek fan. I wasn't interested in this machine until now. I saw lots of photos and noticed that the community loves the game, however there were some factors which just limited my interest in the game. Firstly it's a widebody machine, which means that it is a little wider than standard games and that the playfield naturally has more horizontal space for the elements and ball travel. I don't like most widebody games because many of them play slower than the tighter standard width machines. Then, I like playfields which are straight and have recognizable structures, and most of the older games are designed like this. However, starting with STTNG Williams began designing more and more "colourful" playfields with whirled ramps, wireforms, ball paths, lamp inserts and corresponding art-work. Good examples of this freehand design are Tales of the Arabian Nights and Cirqus Voltaire. I played both machines time ago and learned that they are excellent games, but I would still choose straight design over freehand. The experience made me more open to the other 90s machines, though. However, what got me started with STTNG was something else. It wasn't like I never was interested in it at all, I just didn't care much about it. But I remembered playing it as a child as one of my first pinball games in my life. It were only two games I played and I didn't make it particularly far (I wasn't aware of the ruleset and all), but I walked away partially fascinated (however, any pinball machine fascinated me in that time). 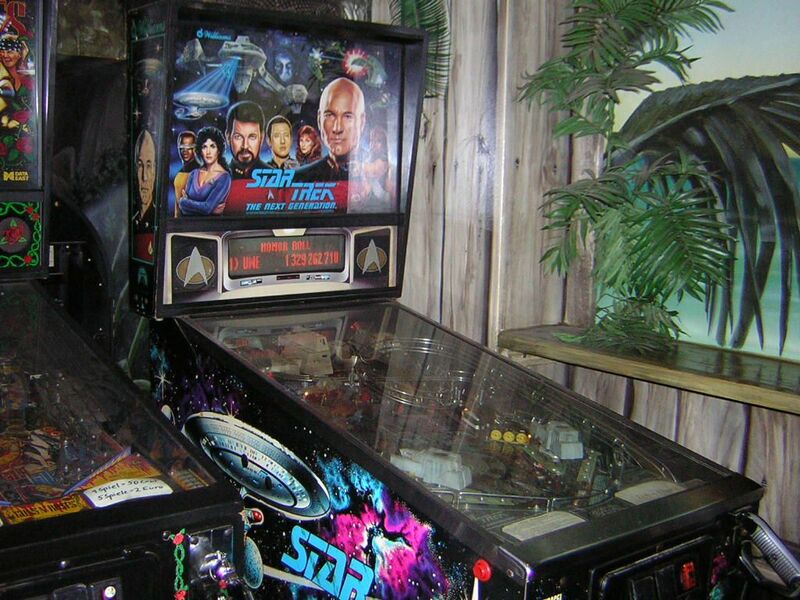 When my friend Chris learned that a Star Trek pinball machine exists, he always wanted to play it because he is a Star Trek viewer, and a while ago I read that there was an STTNG right down the street in a bar not far from here, so we went there to check it out. The machine was dirty and worn, but it played relatively well except for the upper flipper and the right slingshot. We played some games (and made it farther than I did as a child) and it was, as Data would say, intriguing. The machine had ten times greater appeal in reality than on photos or on my computer. One morning I woke up and had an idea. It was so real that I wanted to make it come true. I thought, "you're going to sell your Terminator 2 and try buying the STTNG down there in that bar." Now why did this happen? I was starting to get bored with T2 although it was always a very cool machine and lots of fun. It was also the newest game I ever owned. But all of this didn't help that I needed something else than only my new Diner game, which was very nice and enjoyable - but I had one year of pinball after me and my game skill and demand for challenge and entertainment had grown. I now easily made big scores on Diner and I beat The Machine; only Black Knight 2000 gave me a challenge, however this game is not as complex as I'd like it to be. This didn't initially mean that I wanted to get rid of BK2000, but I needed something new, finally a machine from later than 1991 which had complex gameplay and more features. My need for a classic game is long over anyway; I've moved through several System 11 games and Xenon, and all of them left again be-cause they didn't hold long enough. I could have gotten any modern machine since they are all complex and chal-lenging, however most of them have themes which don't attract me very much, and some of them cost a lot more money than I could ever afford now. 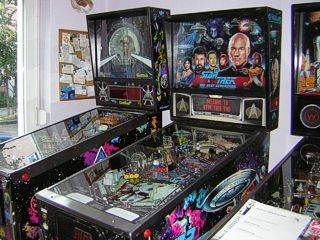 Since I wanted to sell T2, which had practically no challenge left, I estimated to get 600 Euros for it which I would add to some money I had, and I wanted to get the most complex machine I could for under 1000 Euros, and STTNG was the only option, plus I had played it and I knew what I was going to buy. I was still skeptical because of the playfield design and artwork, and mostly because of the theme. 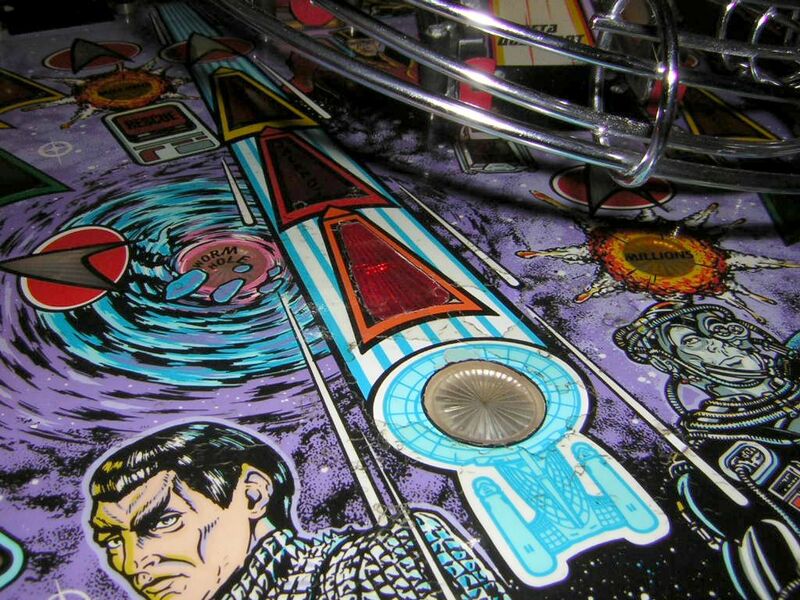 But you don't need to know Star Trek to understand a pinball game. I went down to the bar and asked. At first the guy wanted to tell me that pinball machines normally cost more than 3000 Euros on eBay. Yeah, right. He wasn't in charge though and he told me that the machine was maintained (was it ever?) by a private operator, and I returned later to find that guy and talked to him. He had far more realistic knowledge and I even offered my clean and working T2 to him in exchange for the STTNG shouldn't he want to sell the machine. He denied, but he said he would think about selling for one thousand. That was too much for such a condition and I wanted to stay under one grand, so I looked elsewhere. Frank, a pinball collector in Berlin from the Pinball Network forum whom I had visited earlier this year, owns an STTNG himself and kept looking for offers, and one morning he called me and told me there was an untested and unseen STTNG for sale on the forum for 480 Euros only! At first I didn't understand what he was talking about, but then I quickly looked over the offer. It was one of the forum's prime members selling a few machines from a friend of his who had most of these games stand around for a while and was now fearing space issues. I thought, "what the hell, for half the price it is worth, nothing can be asked for" and I bought it. With T2 selling for 550, I actually got money back! However, I had to invest this money and some more into a brand new dot matrix display because this STTNG was said to have none anymore. The DMD arrived one day before the machine and so the adventure began. I started watching Star Trek: The Next Generation on a regular basis in May. 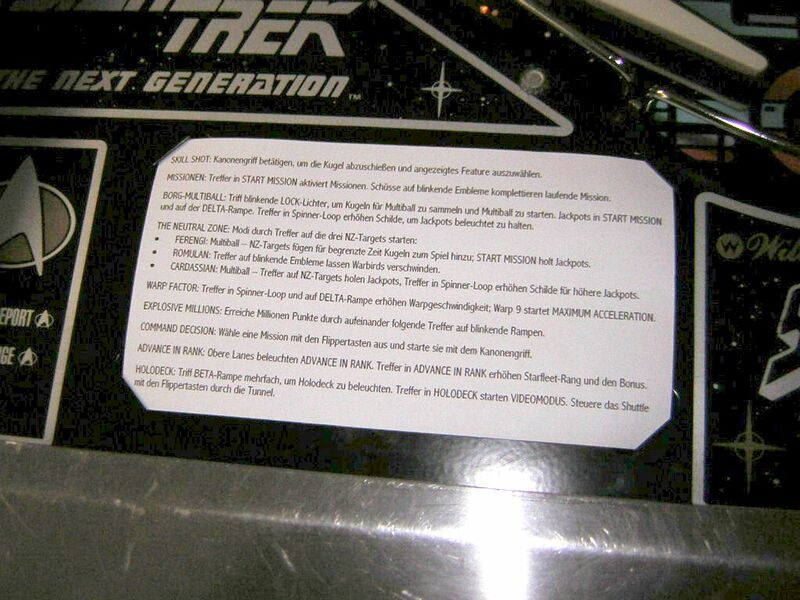 All Star Trek series are somehow circling around German TV (all dubbed, as is the standard in Germany) on different channels and times. It used to be more regular a few years ago, but except for the new Enterprise series and Voyager, the Star Trek universe is more of a filler on afternoon and weekend TV. In my life I have seen a few episodes or at least minutes of every series, like so many people have, and of course I know what it is all about. Star Trek has never fascinated me enough to watch it regularly though because it is not what I consider space fiction. I find space very interesting and pinball builds greatly upon it, but I love the present day space exploration and movies which deal with tragedies and the dangers of space. Star Trek is a vision very distant from what we have today and it focuses so much on characters and their interaction with each other and aliens (most of which are hilariously humanoid), it seems more like a soap opera in space to me (and some others I've talked to). Many people like this, but it isn't what I fall for. Although I like strong character development a lot as I have come to see much more intensive character stories in Japanese animation, Star Trek just didn't do it for me. Plus, most of what I used to see was Voyager and all the terms they used and the problems they encountered were not clearly understandable. Obviously one needs to follow the whole uni-verse a bit to know what is what. Nevertheless I was curious about The Next Generation because of its huge success and, because I want to see every film one of my pin-ball machines might be based on (for example, I would watch the Stargate movie once I get the pinball game), the machine got me interested in trying it out from the beginning where it was easy to understand and to follow the events as they unfolded. Not what you see when you just hop in to any episode running on TV. While being skeptical enough, I got my hands on the DVD version of the first TNG season and started watching (in English, unlike on TV). It was interesting to see it develop and to have the story from the beginning. It was also remarkable to know how early the series began and what it looked like at that time (in 1987), especially the characters who changed looks or disappeared (like Tasha) over the years. I watched the whole season in one week and learned a lot about what I saw and heard in the pinball game, and many things now make more sense to me. Star Trek is still nothing that fascinates me like many other things, but I found my way into TNG and its characters and I simply view it like a "space opera", ignoring the fact that it isn't what I consider great space fiction. Some episodes however do explore great theories and mysteries, and these are among the best I've seen. Also, character development is nice to follow as the characters in TNG are very likeable and sound very natural in the original English version. By now I have seen several seasons and I'm moving on till I've watched all seven, and with every season comes new information which enhances the background that makes the pinball game more enjoyable - although the gameplay itself doesn't require that. The characters, technology and story of Star Trek: The Next Generation are very well captured in this machine. If I had not watched the series, I wouldn't be able to comment on the theme like I can now. 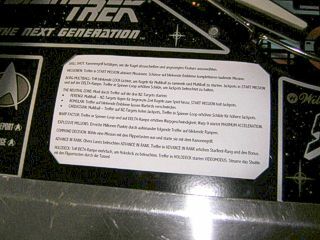 In essence, the game touches a lot of events that happen in the series, shows races like the Romulans, Cardassians and the Borg, implements technology like warp speed, weaponry and energy-matter transports, and connects all these things so that you go on a journey on board the Enterprise when you start playing. You find yourself among the lead cast on the bridge including the seven most important actors lending their voices to the game, a special appearance by Q (also represented by his actor) and some well-known voices from enemies and allies. 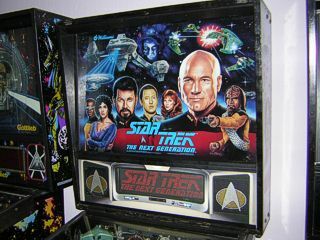 While you play, the modes you start lead you into situations just like they happen in several TNG episodes, and once you face Borg multi-ball, you fight Starfleet's most fearsome enemy together with the Enterprise crew. This approach is quite different from some other machines with licensed themes, and it's very interesting. However, not only the huge variety of characters and events makes STTNG so impressive; the audio which comes in DCS sound features the full theme compressed from rearranged fragments that make the music dynamic, as the song can be looped in intervals (for example at the start of a ball) or stopped for a musical change and later be picked up again. The sound quality is very high, it's not CD quality but DCS is in fact one of the most versatile pinball audio systems and the music in the game sounds very close to what you hear in the series. This also means that a lot of other pieces appear, specifically tailored to the mission or mode you play to give every situation acoustic significance. For example, the Time Rift mission features a very fantastic-sounding music loop which creates mystery and confusion, while the Borg multi-ball has extremely dramatic and pressurizing music which reaches its peak with each jackpot shot. Audio goes on with a lot of Star Trek style sound effects, most of which can be recognized as computer sounds which appear in the ambience of the show, however there are definitively original sound effects too which sound somehow familiar, yet they never appeared in the series. The sound design was very well conceived and produced so that every shot you make either makes the machine vibrate under the deep bass of a ship's flyby or an explosion, or you hear phaser blasts and red alert klaxons enhancing the drama. Combine that with the mentioned musical impact and add the original voice cast, who did a very good job when recording the samples (and there are lots of voice samples on STTNG) = you can hardly dislike the audio of this game. The only downside is that some speech samples are timed very incorrectly, especially noticeable with Worf notifying you of a lit Neutral Zone, who often ends up interrupting another crew conversation because the software tries to use the wrong free moment to play his sample. Visually, STTNG is a mixed bag. Some people and myself find that the artwork on the playfield could have been more threedimensional; it looks very flat on first sight, especially the Enterprise model in the center. The characters on the backglass are quite well drawn, however each character has something to their faces that isn't quite right. This is a little "common practice" in pinball art, though. 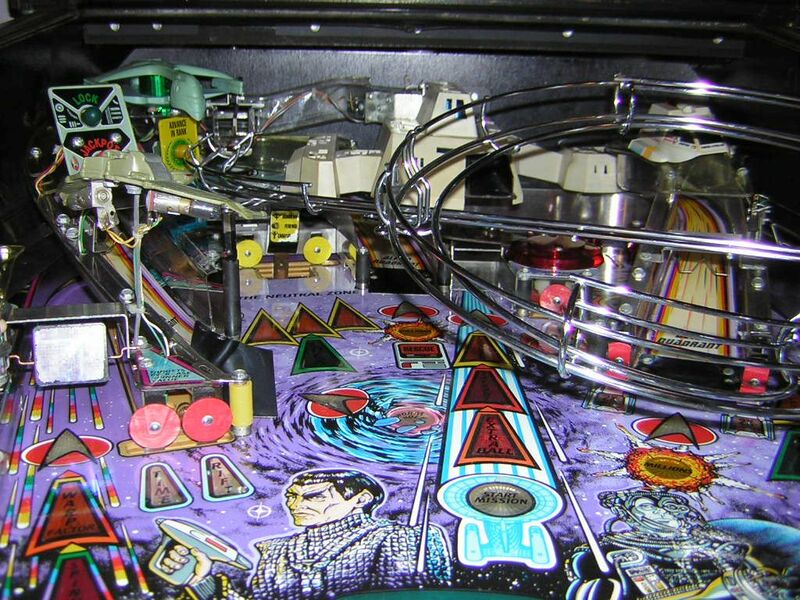 But because visuals aren't only about depictions of objects, I like the colours of the playfield and cabinet a lot. The cabinet artwork packs a punch, it looks truly what you would expect from a modern Enterprise license of any kind. The playfield colour scheme mixes very well with the objects attached to it and the lights - STTNG looks especially alluring when you play it in the dark although the playfield is a bit hard to see in the upper area because the GI lighting isn't very bright there. Still, the lamps only add to the beautiful colour mix of black, purple and blue and give it a slightly warm and spacey ambience. 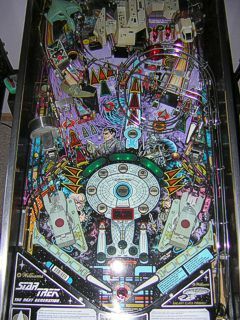 Also, the flasher effects are stunning and really give vibrancy to the upper area of the playfield. 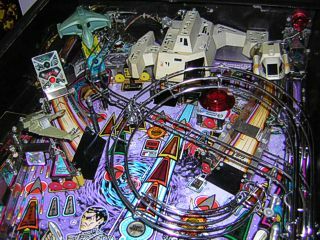 When Borg multiball starts, the whole playfield goes dark and only the three flashers inside the Borg ship turn on to light it up in a greenish blue tone while the Borg prepare to attack. And when the Romulans appear in conflict with the Enterprise, the large green flasher in the center of the Warbird ship model gives it just the mean green look from the show. 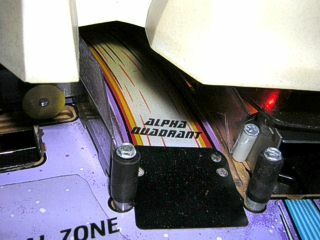 Other flasher effects are the standard white flashers under some plastics which activate whenever a fight is going on, and the three flasher under the playfield to light up the shield lamp inserts in front of the Enterprise model. Toys on the playfield include the ship models of a Bird of Prey, a Romulan Warbird, the Borg mothership (is it? I have yet to see the episode where it appears) and a Starfleet shuttle craft, and of course the two working ball cannons on top of the slingshots. These cannons distracted me when I first saw the machine (at a time when I disliked it), but playing a few games helps you realize how impor-tant these cannons are to the gameplay as they are quite often used for multiple modes, and they are great fun to operate (more on this in the "Gameplay" section). Often these cannons will be used to simulate phasers or probes that you launch at specific targets. 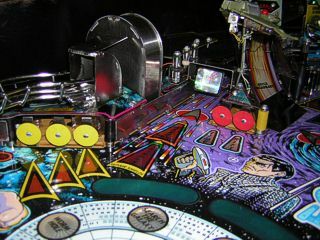 It makes STTNG truly unique although a similar cannon was first used on Terminator 2, but the two cannons on STTNG have much greater use and can hit up to six targets on the playfield. The Star Trek theme also continues on the video side of the machine: the DMD shows countless animations of TNG-related material, for example shuttles flying by when you hit a ramp, the Enterprise doing its famous warp entrance when you increase the warp factor, cha-racters appearing onscreen (which is cool since the DMD is made up as the screen of the Enterprise) and computer animations displaying information on missions. There is also a video mode on the Holodeck where you steer a shuttle through a cave tunnel and must find the right way out while avoiding mines. And to top it all off, a secret video mode which is relatively easy to find has you play poker with Commander Riker! Now this is the really interesting stuff. It is what I bought this machine for, because I wanted complex and addictive gameplay and ball flow, and STTNG has not disappointed me a bit so far! In fact, the gameplay is what makes me come back so many times, it feels almost as good as it used to when I had The Machine for the first weeks. That being said, The Machine was the first "real" pinball game I ever owned, and I came back to practise playing! By now I have the skills and it's difficult to find another game to challenge me and keep me learning again, but against all my doubts STTNG has done that. The playfield has a lot of features to discover. STTNG is a widebody machine meaning that the playfield is a bit broader than standard, and while I don't like most widebody machines, STTNG uses the added space to cleverly distribute all sorts of items which would never fit onto a standard playfield, but the game doesn't become slower at the same time (most widebodies have some slower gameplay due to the added width). Three flippers; three ramps of which one, the Borg ramp, is positioned to the left so that it can only be hit by the upper flipper; three jet bumpers under the right ramp, three banks of standup targets, a large orbit which can be shot through from the left side and lock balls or lead the ball to the bumpers from the right side; a spinner in the orbit which has far more meaning to the game than most spinners nowadays; four sinkholes of which the Neutral Zone sinkhole also features two standup targets to the left and right, serving as one "big" target; a drop target above the bumpers to control locks; lane change and finally the two aforementioned ball cannons on the slingshots. 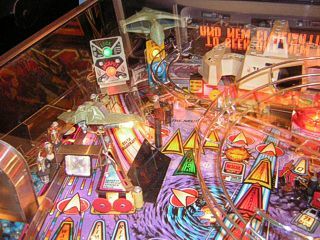 As a rarity in modern pinball, STTNG also features a network of under-play-field ramps with two diverters that control where the balls go after being shot into a sinkhole. A ball can either come out of the left ball popper and drop to the left inlane, or it can be diverted and popped out to one of the cannons to be launched by the player. Firing balls is required in some modes and when you "launch a probe" at the start of a ball, if you decide to do so. The cannon is loaded with the ball and then swings out about 90 degrees waiting for you to hit the gun grip trigger which normally launches balls into play just like on Terminator 2. Once pressed, the trigger shoots the ball out of the cannon and if you aimed correctly and the ball hits the lit target, you are rewarded. Since there are two cannons and each cannon can hit three targets, a total of six targets can be hit and you have to get good at it because the cannons are widely used in the game. While such toys can be argued about since they take the actual pinball gameplay out of the game for a few seconds, I feel that the cannons are a great addition and they are just a lot of fun to operate. Hitting the top center sinkhole from the left cannon to score jackpots in Borg multiball is simply one of the most satisfying shots which I ever experienced! The Missions: On the Enterprise model in the center of the lower playfield you can see seven missions represented by lamps around the saucer section. At game start, the top mission (Battle Simulation) is lit to be started, but you can change missions by hitting the Q target in front of the bumpers which normally acts as a mission advancer, i.e. the next mission will be lit. Once you hit the always-available top center sinkhole under the Borg ship, the lit mission will be started and you will have to try and accomplish the given task by shooting the targets which are lit by the white Starfleet emblems (every target on the playfield has an emblem lamp insert to mark it for a shot). In some missions you have to keep shooting the same target(s), in others you must hit specific ones. While missions like Asteroid Thread (one of my favourites), Time Rift or Search the Galaxy are usual missions which have to be completed before time runs out, Battle Simu-lation is a mode purely designed for the cannons where you have to hit the two top sinkholes alternatively with each cannon, and Q's Challenge is different in that Q appears to "play a game" with the crew and he lights certain targets which you must hit to keep the mission going, or you can add another target by hitting the Q standup target which normally advances the lit mission. The Neutral Zone Modes: Hitting the Neutral Zone targets or sinkhole three times enables it for a random mode out of three, two of which are multiball modes of which one can have up to four balls in play as balls are added by the player when hitting the Neutral Zone in a limited time. There is a mode for the Romulans featuring a threat to the Enterprise with their Warbirds, a mode for the Ferengi who ask for help to reactivate their disabled ship, and another mode for the Cardassians who turn out to be quite unwilling to negotiate their disagreement and open fire on the Enterprise. Each mode plays a little differently and requires a sharp look and precise shots in the right moments to be successful. These modes can rack up big points if played for a longer time! Borg Multiball: When you lock the first ball, it's stored under one of the cannons and sits there unless it's required for another multiball mode. In that case, the machine knows that the Borg multiball will require this ball to be launched into play again when it starts, so both real and virtual locks are possible on STTNG. 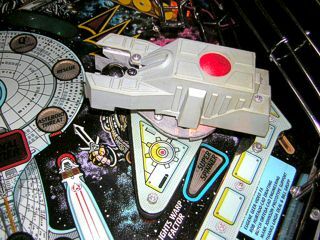 Locking the first ball has a Starfleet admiral notify Picard that the Borg are approaching the space of the Federation, and the ship which sits on top of the playfield appears onscreen when the second ball is locked. The third ball starts Borg multiball when they face the Enterprise and in their usual manner try to "persuade" them to surrender. The multiball begins with the left cannon being loaded to shoot the top center sinkhole for jackpots until either triple (super) jackpot has been scored or any shot has failed. The other two balls are then released for regular play in which you have to hit the sinkhole again for jackpots and the left (Borg) ramp for permanent super jackpot. 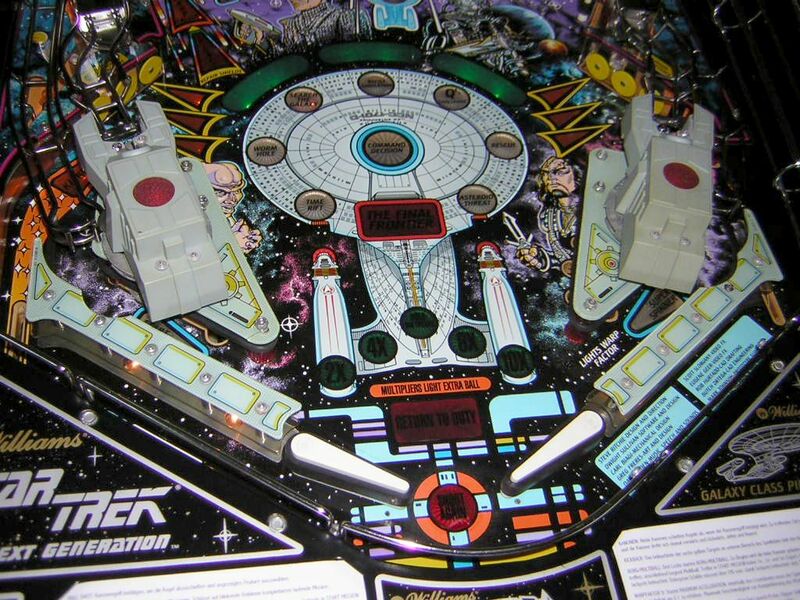 The coolest thing is that either locking a ball or scoring super jackpot on the Borg ramp will result in the Borg ship firing the ball back onto the playfield just in synch with flasher effects and phaser sounds! Also, all hell is breaking loose on the Enterprise while multiball is going, you hear red alert (and the GI dampens at multiball start) and everyone is giving status reports on the health of the ship and crew. It's very much like what's seen on TV. To keep the jackpots lit, you have to watch the shields which keep dropping with every hit the Enterprise gets from the Borg ship, and you can recharge the shields by shooting the spinner loop. Warp Factors: Another cool thing (and difficult to master) is warp factor increasing. On the spinner loop and the Borg ramp, you can rise the warp speed from warp 1 to warp 9, and every factor activates or lights special features. Once warp 9 has been reached, a short timed mode starts where you can push the engines even further to get up to warp factor 9.9 if you keep increasing the factors before time runs out. This sheds out big points and is simply one of the coolest modes in the game as the music completely drops and you hear a very low hum just like the engines of the Enterprise sound when heard from outside. Video Modes: As mentioned above, there is a video mode on the Holodeck featuring a shuttle which you must steer through cave tunnels going to the left and right. These tunnels are filled with mines to avoid and big points to collect. Since the mode is very fast, you have to time your movements very well to reach the end, however it can be learned once and then be repeated forever because the program never changes. Two secret video modes which can be activated with keycodes feature a simple poker game with William Riker as an homage to the poker nights they have in the series, and a very well hidden Breakout game which requires a long code to be entered before starting a game. The Final Frontier: The final mode that can be activated after all seven missions have been started is The Final Frontier, displayed by the huge purple lamp insert under the missions. It doesn't matter whether you completed any of the missions, however it is vital to score big on The Final Frontier as every completed mission awards an artifact which multiplies the score you get for every shot on The Final Frontier. Most of the missions award the artifact when half of the task is completed, so it's not all that difficult if you know what you're doing. Artifacts can also be collected on other occasions. The more artifacts you have, the bigger the reward for every shot will be. Once The Final Frontier is started, six balls are launched onto the playfield and you have to shoot everything you can for maximum score! So far I experienced one Final Frontier which lasted only as long as the ball saver would allow, about 30 seconds. It was just too hard to keep my eyes on six balls and having to aim for targets. Plus I had only collected two artifacts and had a lot of extra balls to help me get there. In fact, The Final Frontier is one of those wizard modes that most casual players never see, and you have to get at least mildly good on STTNG to reach it. It surprised me that I was able to do it already after such a short time of playing (the benefit was that I knew the rules already before the machine even worked, so I had an advantage), so I must be a better player than I thought, but it's still very hard to keep the mode under control and I never reached it again to this day. I'm thrilled to see it happen again in the future, and maybe this time it helps build a really big champion score! Update, 1st August 2005: Today I managed to start The Final Frontier the fourth time, however it still gives me a lot of adrenaline and as still hard to keep under control. I ended up losing four balls quickly and continuously shot the center sinkhole with two balls to score 75 million per shot. That was the best and longest Final Frontier I had so far, but still, it can go better! It's still probably the biggest rush in any pinball game I've played. Besides the modes which keep you busy for some time, there are many little things you can do, and some of these come with increasing warp factors, for example Hurry Up and Super Spinner (which lights the spinner for ten million per spin!). You can use the bumpers to increase the jackpot for Borg multiball or score million points per hit at warp 3, you can repeatedly shoot ramps for various awards and make ramp combos for increasing millions (five, ten, 20, 50, and 100), and some more. Overall there is so much to do that even when you have the rules in your mind, you can still go for so many goals that The Final Frontier is really not the only attractive thing to play for, and this separates STTNG from earlier pinball games like The Machine or System 11 models which had at maximum one top goal to go for if you wanted to "crack the nut". 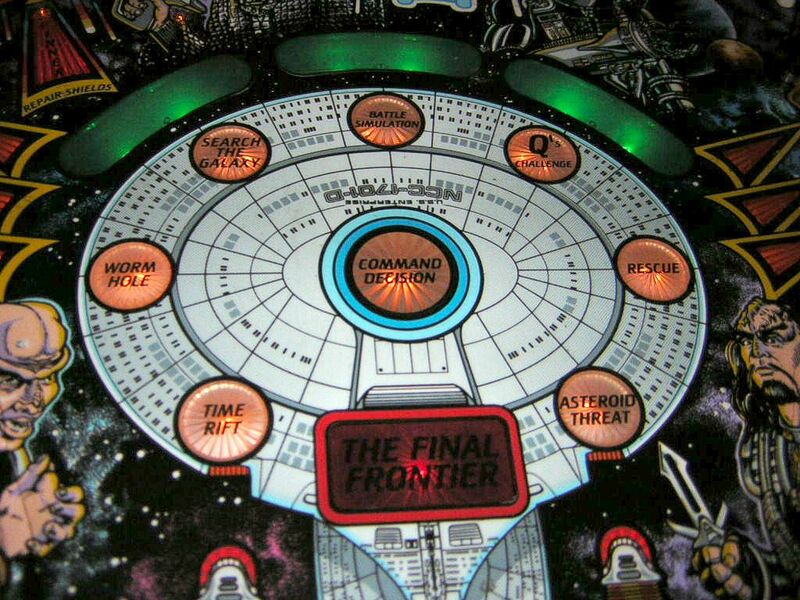 Naturally The Final Frontier, as a follow-up to the seven missions - which are the central modes of STTNG - is the most attractive goal to go for, but warp 9 and Borg multiball are so cool and can be so rewarding if you're just looking for big scores. I find myself aiming for these much more often than trying to complete all missions. Ever since I got my STTNG, I've had quite a journey from the beginning (when I started this article) till the first day when it was playable. I created repair & restoration logs which were originally located here, but since the machine works now and I want to describe the game itself here, I have moved the logs to a separate page which can be found here. At the time of this writing, the machine works except for a small reset problem which I need to fix (localizing it was the bigger headache), and there is some restoration work to be done which includes mylar removal and wear spot touch-up. So keep an eye on the logs in the coming weeks if you want to see how my STTNG becomes the beauty it would have been, had I bought it for the usual price! Update, 1st August 2005: Some days ago I finished the playfield restoration; I have updated the repair logs respectively. The mylar was removed and took some insert print with it, so I had to retouch them. Three inserts including the two pictured above got new text printed on self-adhesive film. Some of the playfield photos in this article have been updated to show what the playfield now looks like since this is how every other STTNG would look if not damaged. 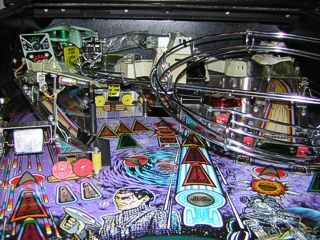 Also, the playfield was cleaned and waxed, the under-playfield ramps were heavily cleaned and new balls were installed in the machine. Star Trek: The Next Generation has become a series I like very much although it will never convert me into a Trekker. I'm just not in for all the fantasy aspects in the Star Trek universe since I prefer a little more realistic science fiction with more emphasis on technology and the mystery of space itself. 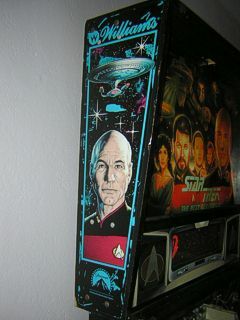 I enjoy TNG a lot though and it gives the design of the pinball game just so much more depth. So did this "galaxy class pinball" hold what it promised? It did for me in every way! While I was not interested in it for a long time, it's probably one of the best games I can get for what I wanted: I was getting tired of the simpler gameplay of the non-DMD games which were a lot of fun and very interesting for the past year, some more than others because they had better game flow, better design or a greater classic value and feel. As I wrote a lot of times, I looked for the perfect classic pinball machine because I totally dig the feeling that some of the old legends create, where you see, hear and feel that you play a true powerhorse of pinball. My failure to enjoy Xenon even though I was convinced it would become a good collection addition, and now my decreased interest in the gameplay of my System 11B and 11C games all led to this - I have just advanced far enough to see that the time was not wasted since I learned a lot and enjoyed many of the games I had, but by now it's time for some pins that really challenge me again, give me back the addictive sensation which I missed on most of the games I owned, and which will stay longer than six months because they are among the best I can get. It seems that I'm after all too young to truly enjoy the old classics and this is the point at which I say goodbye to them, at least for a while (I would have kept some of these games if I had more space, and if it was only for their beauty!). The only classic I still want to get is Space Shuttle because I think this game is still right for me and it might make the perfect add-on to my now modernized collection which essentially consists of three instead of previously four machines. I traded the two System 11 games to buy a Stargate which will arrive next week and take its place next to STTNG and The Machine, and this lineup will probably stay a while, because getting any "better" DMD games from there is hardly possible. With this in mind, I can safely say that purchasing STTNG was the best choice, even though I was a little unsure about it. I'm certainly sure about it now. 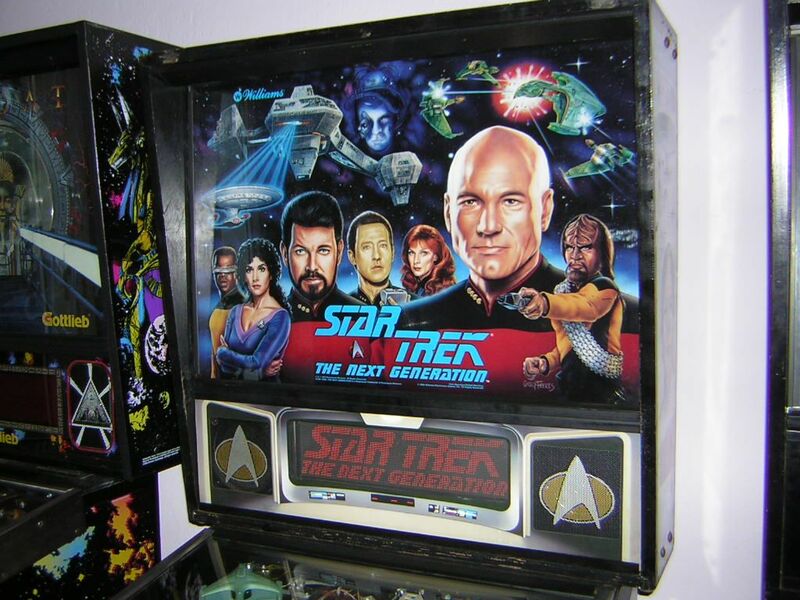 STTNG really is what many people call it, one of the best pinball games in this world, since it combines detailed use of a pinball-friendly license with vibrant audio, video and extremely nice gameplay. I don't know what exactly it is that makes me want to play STTNG over and over again, but I think that the ball flow is one of the bigger aspects that make this game so great to me. Aiming for accurate shots took a while to learn on this machine because the feeling is so different from the other games I had, but after I started playing with skill, I began to feel how satisfying a straight shot into a sinkhole or onto a ramp can be, and the combination spinner loop - Borg ramp which is also called the Picard Maneuver (as taken from the series) proves to me every time I make it that the flow of this game is amazing. Add two cool ball cannons and lots of modes and interesting tasks, spice them with some nice lighting and special effects, mix with great musical score and voiceovers, and bake shortly at warp factor 4 - result: one of the best modern pinball games you can ask for. 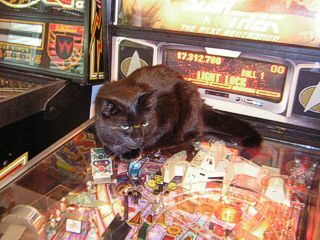 Since STTNG is such a nice game, there is an incredible amount of photos and other stuff on the Internet Pinball Database. I recorded and mixed an extensive game on my machine that includes multiple missions, warp factor increases, cannon usage (probes / Battle Simulation), Neutral Zone multiballs and Borg multiball. The file is almost ten minutes long so you can hear what the game has to offer, but it doesn't spoil any crucial modes. Listen to STTNG here! If you want to play a quite well executed virtual conversion of STTNG in Visual Pinball, get it from VPForums (registration required). Note though that the gameplay in this simulation is not at all consistent with the real machine!